She was small but mighty. 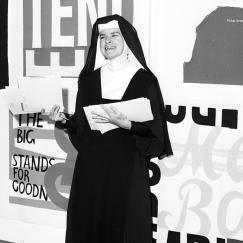 I learned more about Corita Kent by writing about her life in my book, Corita Kent: Gentle Revolutionary of the Heart (Liturgical Press, 2017). I loved how she juxtaposed ordinary images, slogans and words to express transcendent realities. She taught her students how to see. Often Corita would take her students to a local car wash, grocery store or tire store, armed with a paper viewfinder, like the frame in a camera lens through which to look at the place. The Corita Art Center gives out these frames to remind people to look at the world in many different ways. Corita also had some sage advice about film viewing: "Don't Blink." 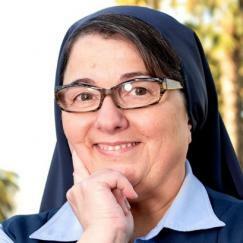 As a Catholic nun helping advance media literacy through my work as founding director of the Pauline Center for Media Studies in Culver City, CA, I teach courses on media literacy for catechists and adults. I write and review film and television for the National Catholic Reporter and other outlets. I love being a Daughter of St. Paul and the many facets of our Pauline mission of communicating God’s love though – and about – media and modern communications. The best way to describe our ministry is that it aims to bridge faith and life, and this was a major part of Corita Kent's work as an artist and educator, where she reminded us that there is infinite beauty in the world around us and we can find it in unexpected places and in unpected ways.